One possible line up of Juventus and Real Madrid. After having some conversation with friends on Twitter and some news from mass media, there is a possibility that Ancelotti may start Gareth Bale in his first team line up. A possibility which also means Javier hernandez will be benched. Let’s say Ancelotti chooses Bale instead of Javier. So, you just need to eliminate Javier from the above picture, replace him with Bale. Juventus themselves have two options of formation. 5-3-2/3-5-2 or 4-4-2 narrow diamond. 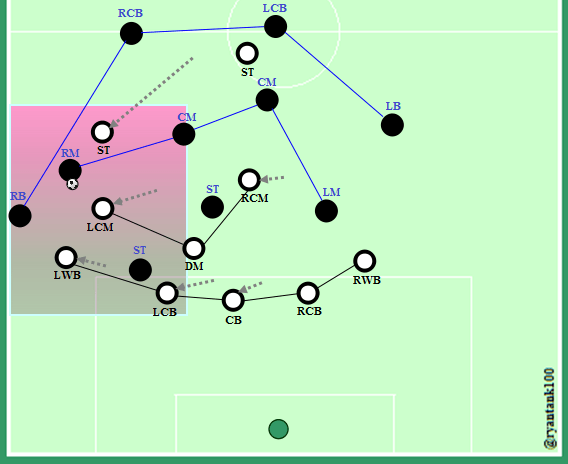 The 4-4-2 narrow diamond has greater chance to be played as Juventus have 4 good central midfielders (Pirlo, Marchision, Vidal, and Pereyra). There’s no urgency for Juve to “sacrifice” one of their midfielder. With them playing together, Juventus area playing to the true strength of their middle line. So, I’ll be happy if Massimo Allegeri opts to line up with these 4 players in their middle line. Andrea Pirlo and Toni Kroos will be the deep creator for each team, who drops off to the line of defence to pick up the ball and initiates the play from there. They’ll spread the ball to the more advance or to the wide area. When Juventus are building up their play, it will be something like 2-2-4-1-1 asymmetric shape at the early phase of it. The two wing backs will get further up, depend on which side Juventus start their attack. If Juventus play the ball through the right side, the right wing back will go higher and occupy the advance area. The left wing back will stay deeper (parallel with the deepest midfielder). Pirlo is the deepest midfielder. Pereyra, Marchisio, and Vidal will stay on #8 respective area. One wing will stay on the same line with this three. The difference will be seen, when Juventus are approaching the final 1/3. Roberto Pereyra as the attacking midfielder and false 10, will go slightly higher. As the false 10, he will join the two strikers and transform Juventus shape into 3 forward’ish. He will act as the hybrid player, who gets involved in both defensive and offensive phase. In defensive phase, Pereyra will help building touchline pressing shape. On attacking transition and attacking phase, Pereyra will quickly try to occupy potential area of attack. The one to pay attention from Juventus is, Carlos Tevez. When Juventus are on their attacking transition, Tevez will be the target. As he is at the peak of his form, Tevez should not be allowed any small space. Madrid are fortunate enough to have pacey defenders. This will be useful for them to deal with Tevez quickness. The other thing is, Andrea Pirlo. Madrid need to nullify his space or at least they need to read where Pirlo plans to direct the play. His long passing play is a deadly weapon for any opponent. With 4-4-2 it will be bit difficult for Madrid to ask one of their central midfield to mark Pirlo. Isco or Bale are more appropriate for such duty. Madrid also another team who always try to play out of the back. Toni Kroos will be the the initiator. As the deep creator he drops off to collect the ball and spread it to the left or right. 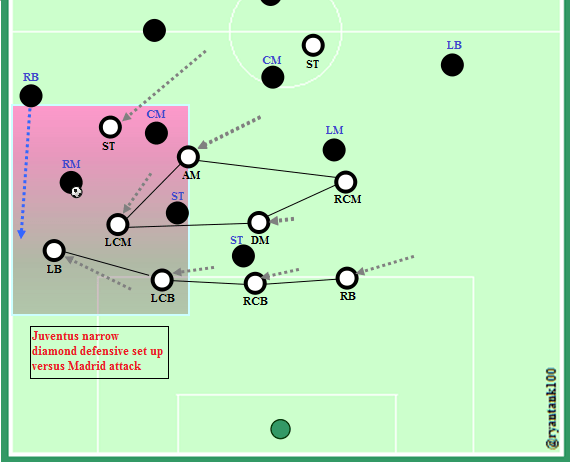 When he opts to pass the ball to the wide area, Kroos plays more directly as he will be trying to reach the wide advance area as quick as possible, where the Madrid attacking winger or one of the drop off striker occupies it. Madrid will try to break the defence through the wide area. The combination of Marcelo-James and Isco-Carvajal will play huge part. With Ronaldo and Bale as the players who are likely to fill the striker posts, these two will have to move laterally to give their support when one of the above wide area combination is on their phase of attack. Ronaldo or Bale will have to move wide and approach the wide area, where the wide area attack is built. They have to make sure Juventus are not being too much numerically-superior. There is a possibility that Juventus will try to nullify Toni Kroos. They have Alvaro Morata or Roberto Pereyra for such specific job. But, if Kroos manages to find the way through and spreads the ball to the wide area, it’s obvious Juventus need to build compact shape to press Madrid on touchline area. The other dimension of Madrid play that need to be watched is their long distance shooting ability. Ronaldo, Bale, and James Rodriguez are the ones who got such ability. Juventus midfielder need to focus at nullifying this alternative of play. Another thing to pay attention is the Sergio Ramos presence. As the more attacking central midfielder, compared to Toni Kroos, Ramos will have greater chance to come late to the penalty box. With this movement he may surprise JUventus defence and hit them through his aerial duel ability. This is one of the possible set up. Madrid try to attack through the right (Juventus left) wide area. This is how Juventus will shape their touchline pressing. The left back (LB) and left central midfielder (LCM) to be the main press. Pereyra, the attacking midfielder (AM) and Morata, the striker (ST) will act as the cover. The defensive midfielder (DM) has t make sure there is enough cover for the area in front of the two central backs (CB’s). In respond to this defence system, Real Madrid right back (RB) will go forward, stays higher and wider than the right midfielder (RM). One of central midfielder (CM) and striker (ST) will come close. Sergio Ramos may be the one for this duty. The striker to be tasked such duty will be Bale/Ronaldo, alternately. 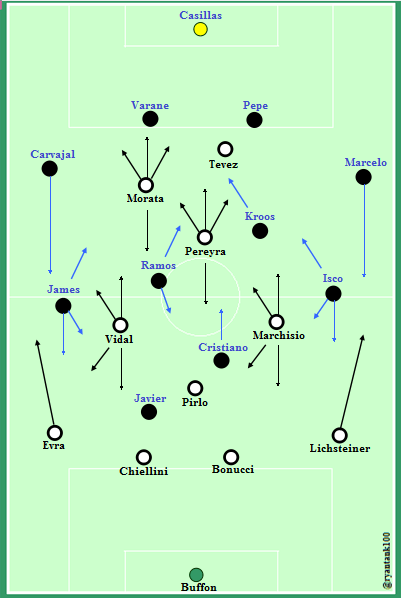 But, how if Juventus adjust their shape in the middle of the match and play with 5-3-2 basic shape? It may be looking like this. 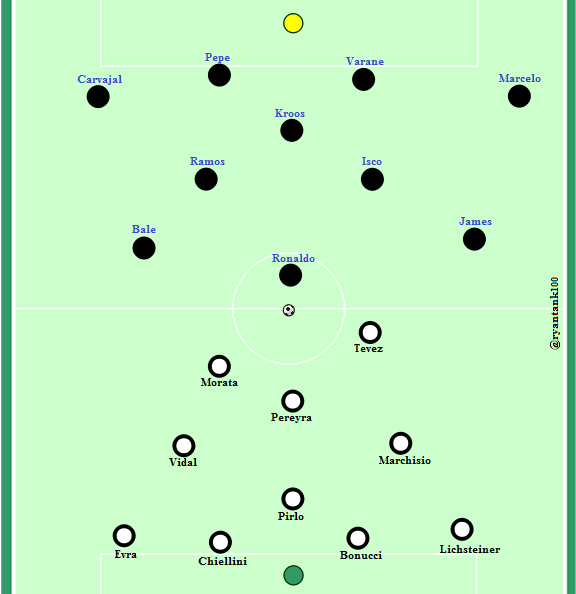 Juventus 5-3-2 defensive system versus Real 4-4-2 attacking shape. Five men behind and three central midfielders in fron of them. Finally, this will be the clash between the attacking-based one versus catenaccio of Italian football. Personally, I wish Juventus opt to play their their counter-atack in fast tempo, just like they did when played Dortmund. If they do it so, we will see a dynamic match. A match where a compact defence try to stop Madrid explosive style and hit them in quick attacking transition. This entry was posted in tactic and tagged Carlo Ancelotti, Juventus, Massimiliano Allegri, Real Madrid, Semi final, UEFA Champions League. Bookmark the permalink.